Flash Slideshow Maker is a professional software which can create Flash SWF slide shows with your photos in minutes. With it , you can turn photos into a dynamic SWF files and upload it to website for sharing or using in your own blog or websites. What can Flash Slideshow Maker do? It can convert your digital photos to professional slideshow galleries with kinds of templates. It can help make dynamic Flash banners, Flash intros and put them on your web sites easily. With it, you can build wonderful XML photo slideshows and tell your stories with background audio. It can turn your photos into web albums for playing on Facebook, WordPress, Blogger or your web site. It is an ideal images presentation tool for photographers. Flash Slideshow Maker enables you to import photos by dragging photos and dropping them to the app. Or you can use “Add All” to import all photos in a folder. Then you can arrange photos order by dragging, add subtitles, art clips, rotate photos. Also you can choose transitions effects and set transitions and slides time. Click “Theme” tab, you can choose a theme from the Category drop-down list. 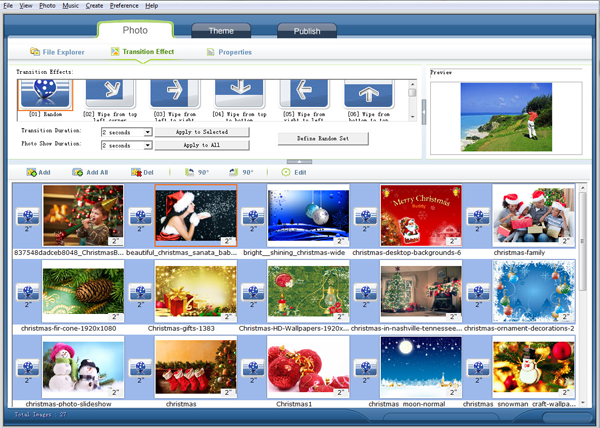 There are kinds of themes are available, including 3 D themes. Flash Slideshow Maker for Mac 1.2.0 integrates more than 60 preset Flash templates, the Windows version Flash Slideshow Maker Professional 5.10 includes more than 100 Flash templates. After choosing a theme, you can customize it to meet your needs. Switch to “Publish” to create the flash slideshow. 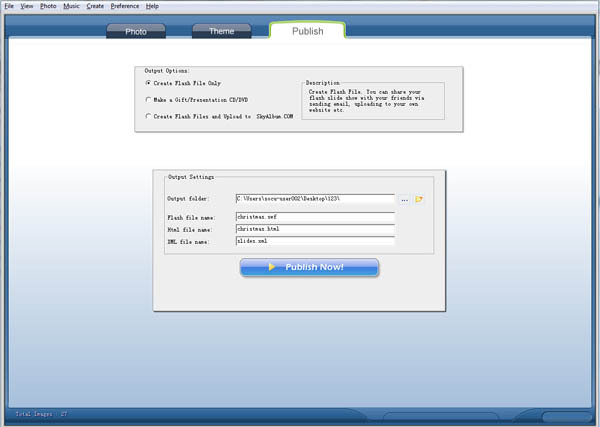 The flash maker will generate a SWF flash, a HTML file and XML file. Also you can directly publish the swf flash slideshow to SkyAlbum.com, then share it with friends, or copy and embed code to your website or blog for demonstrate the flash slideshows. This entry was posted in Flash Slideshow Maker and tagged create flash banner, flash slideshow maker, photo galary, swf flash creator on December 19, 2012 by Sarah Jablich.